While we can almost be certain the iPad mini 2 will be come in a darker shade of gray, details have dropped potentially revealing new tech specs for Apple new iPads. What's more, we could be in for a more celebratory shade for the smaller iPad. Apple leak expert Sonny Dickson is back again with new images of space gray suited iPad mini 2. The new pics, posted to Twitter, add further credence to similar photos we saw last week. The new miniature iPad will supposedly come with 1GB of RAM, while the hunkier iPad 5 will have 2GB. This upgrade will mean the entire iPad line will be getting twice the amount of RAM compared to the last gen models. Dickson also tweeted that the iPad mini 2 will be available in gold and silver in addition to space gray. A gold tab would of course follow the wildly popular color option Apple introduced us to with the iPhone 5S, one Samsung decided to jump on as well. 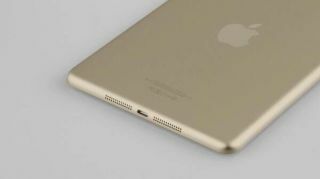 Hot on the heels of Dickson's tweets, we also caught newly leaked images of a gold iPad mini with Touch ID over at DoNews. Just like iPhone 5S' questionably reliable fingerprint scanner, the tablet in the leaked image has a home button with a ring around it, indicating the presence of Touch ID tech. But before you get your credit card primed to buy a blinged out iPad mini 2, you should take these new images with a grain of salt - especially when this new golden boy seems to be the very first full, assembled tablet unit of this color we've seen. These photos could just be rushed color-corrected images of the current iPad mini. Of course we're all eager to see what Apple has in line for its next generation of tablets which could be revealed in the coming days as we get closer to the rumored Oct. 15 tablet extravaganza. Check out Apple's tablet competition, Microsoft with its Surface 2 and Surface Pro 2.